Select panel presentations and interviews with school officials and other education leaders at the 2016 Joint Annual Conference were recorded and produced by the Illinois Channel. Below are five videos recently posted from the November 18 – 20 event. The Illinois Channel is a 501 c (3) nonprofit corporation, modeled after C-SPAN, which produces video programming on state government, politics, and public policy. 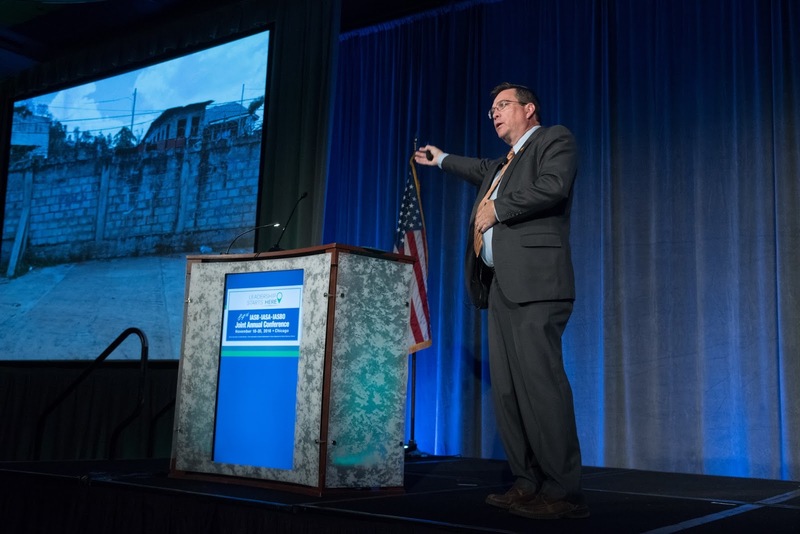 At times sobering, alarming, and hopeful, Michael Dorn, one of the nation’s foremost experts on school safety, presented the keynote address at the third General Session of the 2016 Joint Annual Conference. Combining personal anecdotes, data, and practical illustrations, Dorn championed an “all hazards” approach to safety in a presentation entitled “Active Shooters, Active Killers, and Terrorism in the School Setting – Accurate, Practical, and Actionable Information.” Dorn discussed his work in training school personnel, and in doing so determining what types of approaches work and what do not. Dorn is executive director of Safe Havens International, a non-profit campus safety organization that offers planning and training for a wide range of school crisis situations. While stating, “we can still improve,” he shared statistics that showed that schools are safer from most dangers now than they were in the 1970s. Dorn noted that the public perception of school safety is “out of whack” from where we really are. Despite increased risks in some areas, school leaders and law enforcement have made enormous progress in keeping students and staff safe. “School has to be a harmonious balance between the data that we give you, and the heartfelt passion that you bring to your work,” Dorn said. Dorn explained that medical emergencies, not criminal or terrorist acts, are responsible for more injuries and deaths on school property. He noted that school districts are making progress in dealing with those emergencies as well. “We’ve got to get very thoughtful. We’ve got to not get focused on any one type of attack or weapons methodology,” Dorn said, as he showed a graphic video that illustrated how weapons can be hidden under a person’s clothing. Dorn recommends training that includes behavioral approaches, such as suicide assessment and prevention, student threat evaluation, and pattern matching and recognition and pre-attack indicators. He also related that many recent approaches to securing schools from the more dangerous events are not working, and offered research-based solutions for successful preparation and spoke of the dangers of fear-based programs. He reviewed common gaps in planning and strategies, and how to overcome them. “What’s surprising to us is in the field of school safety we are seeing a degradation in the ability of school staff to make life-or-death decisions, since the Sandy Hook shooting,” Dorn said. “This is after we’ve spent billions of dollars trying to make schools safer. The Third General Session was opened by Derek Hutchins, president of the Illinois Association of School Administrators and superintendent of Crab Orchard CUSD 3 in Marion. Hutchins presented the Superintendent of the Year award to Jason Henry of Sesser-Valier CUSD 196. Doug Floski, of Byron CUSD 226, received the Thomas Lay Burroughs Award as the state’s outstanding school board president from Lula Ford of the Illinois State Board of Education. Additionally, IASB president Phil Pritzker presented the Holly Jack Outstanding Service Award for school secretaries to Karen Vota of Coal City CUSD 1. 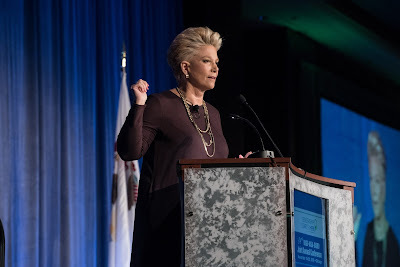 The Third General Session concluded the 84th Joint Annual Conference of the Illinois Association of School Boards, Illinois Association of School Administrators, and Illinois Association of School Business Officials. 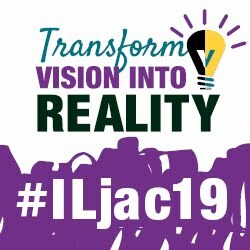 This year’s Conference drew more than 9,600 registrants and featured panel sessions, pre-conference workshops, general sessions, exhibits, and other leadership development opportunities for public school leaders in Illinois. Television journalist Joan Lunden told a large crowd at the Second General Session on Saturday that it is important for adults to let children know about the challenges in today’s world. “We tend to solve problems for them, rather than let them figure it out for themselves,” she stated. But problem solving is an essential skill, and life-long learning has become a necessity, she said. Lunden, known to millions for co-anchoring ABC’s Good Morning America in the ’80s and ’90s, said that as a child in California she pondered becoming a doctor, like her father, Erle Blunden, a cancer surgeon who died in a plane crash when she was 13. 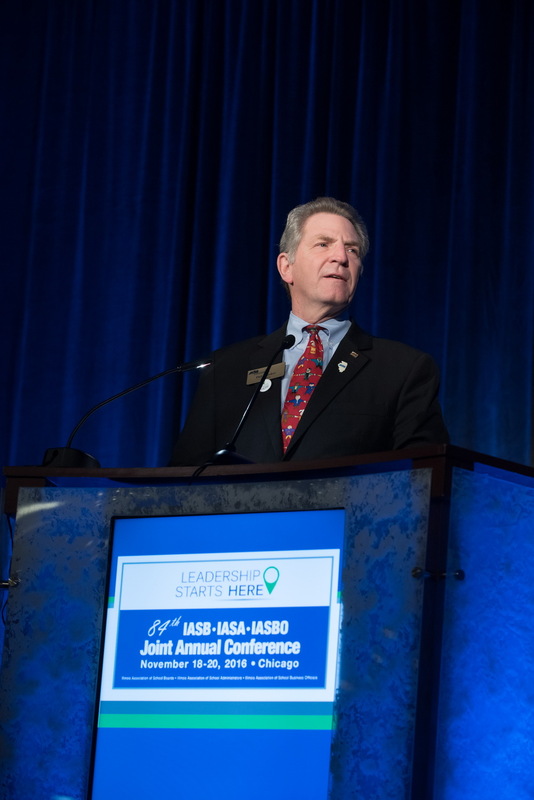 Before Lunden’s keynote address to the 2016 Joint Annual Conference, Jennifer Hermes, Illinois ASBO president, said the school management profession is well served by that organization’s wide range of professional development activities, services, and advocacy. Hermes, who is a business official with Lake Forest SD 67, also introduced the two recipients of this year’s Lighthouse Award, John Fuhrer, Director of Operations, Facilities and Transportation, North Shore SD 112; and Scott R. Mackall, Assistant Director of Operations and Facilities, North Shore SD 112. Also at the Saturday general session, IASB President Phil Pritzker introduced IASB past presidents: Joseph Alesandrini, 2010-11; Carolyne D. Brooks, 2012-2013; Christy Coleman, 2002-2003; Jerald Eiffert, 1999-2000; Nancy Elson, 1990-1991; Karen Fisher, 2013-14; Jonathan T. Howe, 1978-1979; Joan Levy, 1984-85; Dennis McConville, 2001-2002; Mark Metzger, 2008-2009; Robert Reich, 1992-1993; Marie Slater, 2006-2007; Jay Tovian, 1996-1998; and Barbara Wheeler, 1988-1989. Acknowledged with them were IASB Executive Director Roger Eddy, along with Michael D. Johnson, who served as the Association’s executive director from 2000 to 2012. Lunden began her remarks by sharing vivid stories from behind-the-scenes struggles in making a path in the male-dominated field of TV journalism during the 1970s. She provided insights on the need to persevere, grab opportunities, and continue to learn and work in concert with a team. Specifically, she shared recollections of starting out in journalism by taking a job as one of San Diego’s first female weather reporters. When offered the job, she admits, she was not even remotely interested in weather, but she knew she would always be interested in opportunities. “Sometimes we must risk not being great to learn how to really be great,” Lunden said. She performed well enough to later get an offer from the station to become its consumer reporter. She says she replied, “Sure, I can do a report every night,” even though at the time, she now admits, she had doubts. “Never underestimate the power of a positive attitude,” she added. But Lunden eventually left the evening news desk in San Diego to take a job with WABC in New York as a street reporter, covering fires and murders. “There is merit in learning from the ground up,” she explained, admitting she knew she needed more real-world training and experience. Children have the same problem turning off devices and tuning in to others, as they typically worry about the consequences of how they are viewed by their peers on Snapchat, for example. “Kids need to develop interpersonal skills in face-to-face encounters instead, because this develops business skills,” she suggested. Children ultimately need to learn to become lifelong learners and risk-takers, she suggested, and it is her hope for everyone to find passion in their own education and experience. “Someone once said that our two greatest days are the day we are born and the day we find out why,” she added. After her remarks, a line of more than 100 people waited to meet Lunden outside the conference bookstore, to take selfies and to get autographs of her latest book, Had I Known: A Memoir of Survival. Mawi Asgedom began his life in Ethiopia but has lived most of it in Illinois. Through a refugee relocation project, his family moved to Wheaton, where they had to learn how to assimilate into Midwestern suburban culture. His parents did not read or speak English, a fact that he used to colorfully punctuate the awkward moments of his early family life. But he overcame their limitations and excelled at academics. Asgedom eventually attended and graduated from Harvard University. A strong family work ethic also led him to start his own education leadership firm, Mawi Learning, which offers online and blended training. A free book and website was offered to those in the audience to explore those options in more detail. The thrust of his message centered on how to change the focus of the day-to-day challenges in the classroom and board room. By refusing to enter or be distracted by “victim” conversations and excuses, education leaders are free to concentrate on their resources and how to creatively use them, he explained. “You (already) have the power to change lives. Stay on mission and stay out of the traps,” he said. Asgedom effectively used several audience participation activities to emphasize his point. This included asking each person to greet the person next to them as if he or she was the person that they had always wanted to meet. He emphasized the need to not overlook anyone, staff or student. Later, he used a jar of colored gumballs to demonstrate how to use all resources that are available to a school leader. “When you focus on the problems and obstacles, you lose access to your resources,” he said. His answer is to figuratively find and hit the “turbo” button available to everyone. 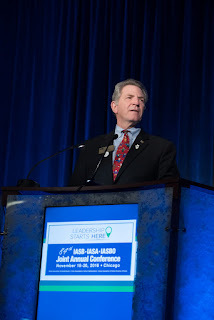 Asgedom was welcomed by IASB President Phil Pritzker, who opened the 84th Joint Annual Conference of school boards, superintendents, and school business officials. 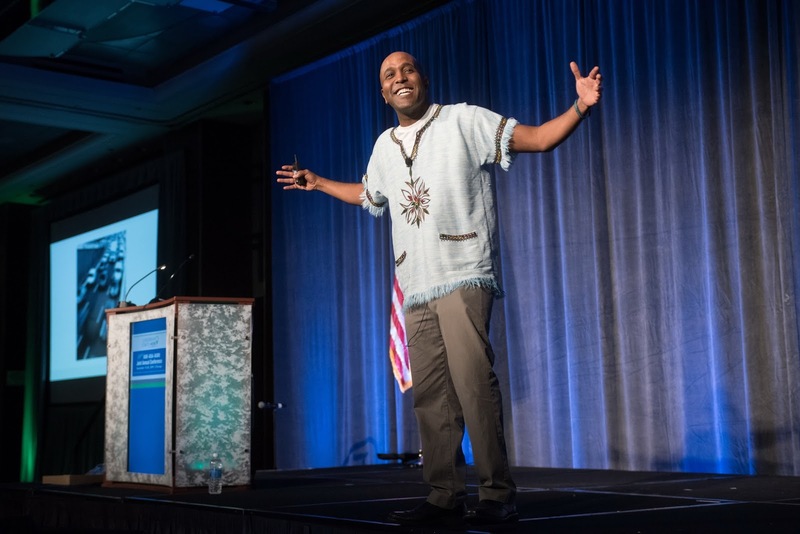 He noted that the conference theme was chosen because it was short, memorable, “but more importantly, relevant to those who come to this conference to become more effective, responsible, and confident school leaders. Whether you’re just starting your career or are a veteran of this annual event, we believe that you’ll leave here better informed, better equipped, and better prepared to do your job,” he said. The first of three general sessions was also used for several award presentations. LaMoille CUSD 303 received the David Binotti Risk Management Award from the chairman of the Workers’ Compensation Self-Insurance Trust. Two other districts, Meridian CUSD 15 and Community HSD 94, were honored with Awards of Distinction in the annual Exhibition of Educational Environments. The honors were shared by their architectural firms, BLDD Architects, Inc., and DLA Architects, Ltd., respectively. Several student groups also participated in the opening session. It was preceded by several numbers performed by the Monticello Middle School Jazz Ensemble, and followed with posting of the colors by the Phoenix Military Academy, and the National Anthem, performed by honor students from Cooper, Holmes, and London Middle Schools, Wheeling CCSD 21. Handouts (PDF Word documents or PowerPoints) from many of the panels presented at the 2016 Joint Annual Conference are available through the Members Only portion of the IASB website. Panels with links to their materials are listed by the panel title, hotel location, and room name. The panels appear in chronological order of the Conference; by the day and time slot they were presented. The only exception to this order is the board secretaries' panels. Those materials are listed after all the other panels. Note: panels are only listed if materials have been submitted. Additional panels and their online materials will be posted as they are received. The links to these panel materials will be available until Sep. 1, 2017. To download the panel handouts, simply click on the link for the desired document. The handouts are available by logging-in to the IASB member database, choosing the Members Only tab at the top of the page, and selecting Annual Conference from the drop-down menu. Once there, find the section entitled “2016 Conference Handouts” and follow the link. For detailed instructions on how to login to the IASB member database, click here. Chris Buikema has been appointed to replace Ben Andersen as director of the Association’s Northwest division. A 12-year board veteran, Buikema was formerly the legislative chair and resolutions chair for the division. He has been a school board member at East Coloma-Nelson SD 20 for the past four years, and is currently serving as vice president. Buikema previously served eight years on the Nelson SD 8 (Rock Falls) school board, which was part of a two-district consolidation in 2013. Buikema is also on the board of directors for the Illinois Education Association, serving as Region 20 chair for the teachers’ group. 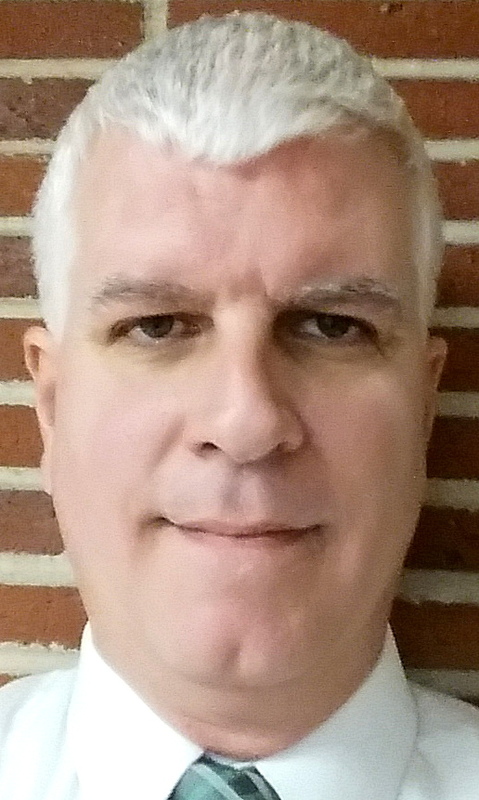 A social studies teacher, he has been employed at Rock Falls High School for the past 17 years, where he also is the head coach of the boys’ golf team. “It’s a genuine honor and pleasure to join the IASB board,” Buikema said. nine years. 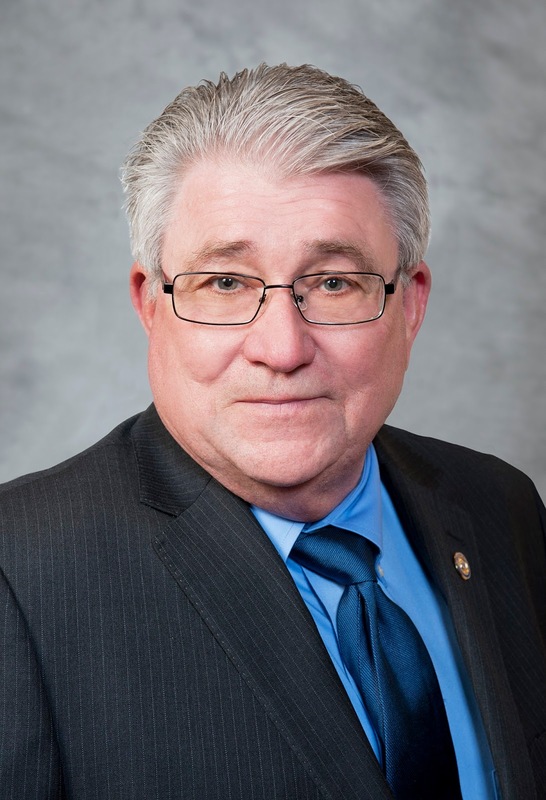 A member of the East Dubuque CUSD 119 Board of Education since 1986, he has served as president and vice president, and chaired the board’s buildings and ground committee, as well as serving on its finance, policy, business, and budget panels. As an IASB Director, Andersen had served on the Association’s Nominating Committee, 2008 and 2009; on the Audit Committee, 2010; and the Executive Committee, 2011. Andersen, a small businessman and entrepreneur, also is a Lion’s Club member and has been active with various community organizations, including serving as president of the Community Mental Health Board of Jo Daviess County. “I will miss all the dedicated fellow board members and staff at IASB, but I thought it was only fair to let my replacement on our board have a chance to get acclimated to the job of director. I am stepping down from my local board in April after 30 years, at age 66, and am preparing to move to Florida in retirement,” he said. 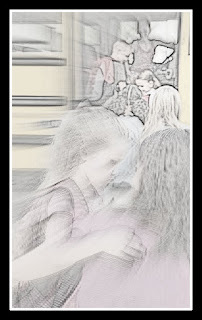 The federal Every Student Succeeds Act (ESSA) requires school districts receiving Title I funds to develop and implement written procedures for transportation of foster children at their school of origin, provided that it is in each student’s best interests. The federal law says such transportation should be provided, arranged, and funded for the duration of the student’s time in foster care. Illinois school districts are not free to develop these procedures independently for the 17,000 children in foster care in the state. Instead, ESSA requires that the procedures be crafted in collaboration with the state or local child welfare agency. Note that ESSA, in similar fashion as its predecessor, NCLB, is an amendatory act under the umbrella of the Elementary and Secondary Education Act of 1965 (ESEA). Additionally, ESSA amends related federal statutes, such as the McKinney-Vento Homeless Assistance Act, Protection of Pupil Rights Act, and the Boy Scouts of America Act, among others. As a result of all these parameters and restrictions, IASB and Illinois districts had to await guidance from the Illinois State Board of Education and the Department of Children and Family Services (DCFS) regarding the necessary options to remain in compliance with ESEA, ESSA, and Title I funding rules on foster care transportation. On Dec. 12, ISBE issued Guidelines for Determination of Best Interests and Transportation and Procedures for Dispute Resolution (Bulletin 01-16). The correspondence aims to assist school districts’ compliance with ESSA’s requirements relating to foster care students’ educational stability, including the obligation to develop transportation procedures. PRESS Issue 93, released in early November, included an update to policy 4:110, Transportation, addressing district compliance with federal foster care student transportation obligations by adding a sentence to assure districts will meet transportation needs of foster care students in accordance with ESEA. The Association is also considering how best to assist members in developing ESEA-compliant foster care transportation procedures, and whether further PRESS material on this topic will be necessary. “We [IASB] will issue updates on this topic as more information becomes available. In the meantime, boards are encouraged to review Issue 93 updates to policy 4:110 and consult with their board attorney to determine if the district needs to do anything in response to ISBE’s guidance,” Brotine said. Additional information on this topic is available on the IASB School Law webpage. Further questions about the issue should be directed to Maryam Brotine, at 630/629-3776, ext. 1219 or by email at mbrotine@iasb.com. day to file objections to nominating petitions. Several key dates remain for school board candidates running in the April 4, 2017 consolidated election. Tuesday, Dec. 27, is the last day to file objections to nominating petitions. Objections must be filed in the office of the county clerk or county board of election commissioners in which the principal office of the school district is located. Wednesday, Dec. 28, is the final calendar date for a ballot placement lottery, should one have been necessitated due to a simultaneous filing of nominating papers. As usual, names of qualified candidates are placed on the ballot in the order in which their nominating papers are received. But when required, a lottery is held for the first and last spots on the ballot if multiple candidates’ papers were filed simultaneously in either the first or last hour of the filing period. Thursday, Jan. 26, is the deadline day to formally withdraw as a candidate. 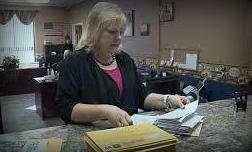 School board candidates must file notarized papers to withdraw their nomination by that day, which means filing with the county clerk or county board of election commissioners in which the principal office of the school district is located. The last key date is Thursday, Feb. 2, which is the final date to file officially as a write-in candidate. Any such candidate must file a notarized Declaration of Intent to be a write-in candidate with the appropriate county clerk or county board of election commissioners. Write-in votes are not counted for those who have not filed such a declaration. 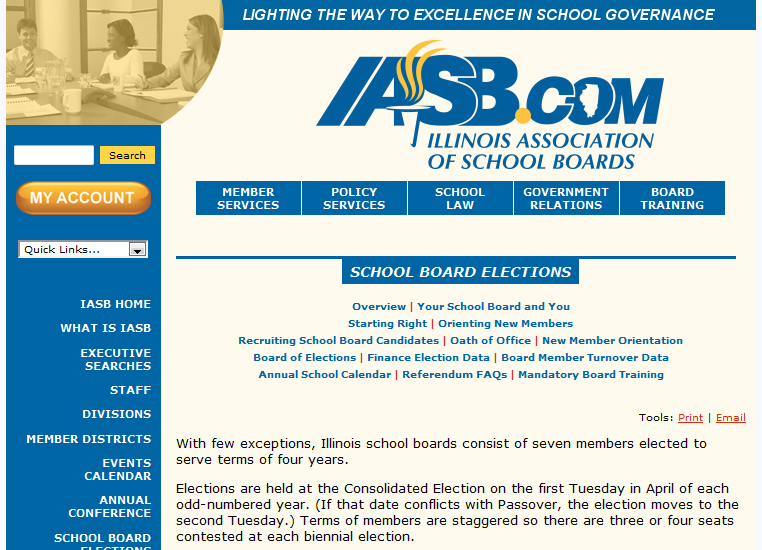 including links to the state elections board and sample forms, here. Today is the last day of the Dec. 12-19 filing period for candidates to run in the April 4, 2017 consolidated election, which includes school board elections in most Illinois public school districts. Names of qualified candidates will be placed on the ballot in the order in which nominating papers are received. If necessary, a lottery will be held for the first and last spots if multiple candidates’ papers are filed simultaneously in the last hour of the filing period. For more information, visit 'The Ounce' website. The Ounce of Prevention Fund is inviting school leaders to apply for a chance to attend their two-day summit on best practices and strategies for ensuring a strong continuum of high-quality educational experiences for children from birth through 3rd grade. District leaders and experts must apply and be accepted to attend the event on March 22-23, 2017. The summit will share various approaches and local examples aimed at improving student outcomes in the early years. The so-called Excellence in the Early Years: District Leadership Summit will also "highlight policies and practices that are creating high-quality classroom experiences, building professional capacity and supporting students and families throughout the early learning and early elementary years," according to event organizers. Those encouraged to attend include district leaders, such as school board members, superintendents, assistant superintendents, chief academic officers, and early childhood directors. Districts are being encouraged to send a team of three or four people to learn, network, and problem-solve together. Registration and meals are complimentary. Attendees are responsible for lodging and transportation. Rooms are available for a reduced rate at the Loews Hotel in Chicago for the night of March 22. This national summit will begin at 2 p.m. on Wednesday, March 22 and conclude on Thursday, March 23 at 2 p.m.
Space is limited. Registration will be confirmed on an individual basis using a rolling selection process. Early registration is encouraged for priority consideration, organizers say, with a maximum of four participants per organization. Those interested may share this information and apply now. Those who attended the 2016 Joint Annual Conference can help IASB improve future Conference programming by completing an online survey. The survey is available until December 12, 2016. Click here to take this online survey. There are just two sections and a total of 35 questions, with Section I of the survey dealing with the overall Conference experience and Section II asking opinions about specific Conference sessions and activities. The following are editorials, commentaries, and opinions from various sources regarding public education, collected in November 2016. Comments and opinions of websites linked from this page do not necessarily represent the opinions of the Illinois Association of School Boards. We talk a lot about civic education. School board elections are coming up. So what exactly does a school board member do?